Gokyo Lake trek itinerary is an alternative trekking itinerary to the Everest base camp trek itinerary. Gokyo valley trek itinerary offers the best view of the Everest Himalayan range in Everet region. Gokyo Ri trek itinerary covers the beautiful Gokyo lakes, glaciers, panoramic mountains and more. Gokyo lake trek itinerary may follow Gokyo Cho La pass trek itinerary, Renjo La pass trek itinerary, and Everest 3 passes trek itinerary. Only trekking days to Gokyo valley is 11 days and it also may finish in 10 days or longer. Remember us for the best Gokyo lake trekking itinerary, Gokyo valley EBC trek itinerary, Gokyo Ri Renjo La trek itinerary, and more Everest trekking itinerary. Day 01 : Kathmandu Arrival (1350m.). As you arrive at Kathmandu, Tribhuvan International airport, our representative will greet you and drops you at your hotel. After the hotel checkout, you can do some rest and relax in the hotel. If you want to make the place familiar then you can stroll around the Thamel Bazaar in the evening. You can also enjoy the welcoming dinner with our whole team and stay overnight at Hotel. After pleasing night at the hotel, you will have a morning breakfast and we will manage you to visit UNESCO World Heritage Sites such as; Pashupatinath Temple, Swyambhunath Temple, Boudhanath Stupa, and Royal Kathmandu Durbar Square. In the evening our representative will provide you with an explanations short class about our Gokyo Valley trek and you will be ready for the next day trek. You will stay overnight at the same hotel. 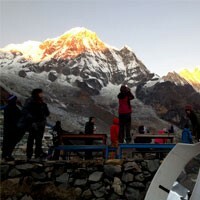 Today, we will have a morning breakfast and take an air-flight to Lukla, the gateway town to the Everest Trek. Around 45 minutes flight offers us magnificent views of the white and green mountains and various settlements. As we reach to Lukla, after short rest, we will begin our trek towards Pakhding, at the altitude of 2610m. You will trek downhill around four hours by following the very beautiful Dudh Koshi River and reach to the small village called Phakding. Stay overnight at Phakdhing. In this day, we will have an early breakfast and we will continue our pleasing trek mostly uphill to Namche Bazaar by crossing the several teahouses on the way. We will also cross several suspension bridges with the stunning views of the Himalayas. As you reach the Namche Bazaar, you can interact with the Sherpa People and get involved with their unique culture and traditions. Stay overnight at Namche Bazaar. Today is the day for rest and stroll around and explore the mysterious mountain market. You can make the short hike to the top of the Namche and visit the Sherpa Museum and enjoy the stunning views of the Himalayas such as; the Everest, Ama Dablam, Kantega, Thamserku, Tawoche and any other peaks. You will also hike up to Syangboche Airport where you can witness Everest view Hotel and see rewarding views of the Himalayas, Khumbu Peaks with spectacular sunrise and sunset views. After exploration, you will descend down and stay overnight at Namche Bazaar. Day 06 : Namche Bazaar to Dole 4110m 6 hrs. As morning rises, we will have a breakfast and continue our trek onwards Dole by following the beautiful forest of Pine and rhododendron. You will also cross the lively Tengboche Village where you will also explore the highest Monastery and surrounding over there. You can also enjoy fascinating mountains views of the serene forest and cultural and spiritual vibrations. Overnight at Dole. In this day, after having breakfast we will continue our trek with the magnificent views of the Himalayan Peaks of Cho Oyu, Tawache, Thamserku, Kungtenga and many more. Today we will trek around 4 hours reach to the Machhermo, south of Gokyo. Overnight at Machhremo. Today after early morning breakfast, we will continue our trek towards Gokyo, situated at the elevation of the 4750m. 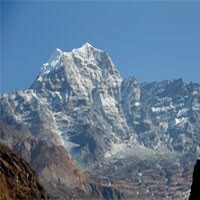 we will trek uphill by following the ridge with the stunning views of the Himalayas. You will cross the Glacier moraine and first Lake and finally reach to the Gokyo Valley. Stay overnight at Gokyo. Day 09 : Gokyo Lake Exploration Day. In this day, we will have an early morning breakfast and explore the Valley. You will explore the fifth Lake and fourth Lake with the majestic views of Mt. Everest and Cho-Oyu. You will also explore the biggest glacier in the world namely Ngazumpa. Overnight at Gokyo Lake. Day 10 : Hike to Gokyo RI (5360m) and trek down to Dole(4110m. )4 hrs. his is our a special day to see all the mountains of the Everest range. We hike up to the Gokyo Ri early morning about two hours steep from here we see four high mountains above eight thousand meters like Everest, Lhotse, Makalu, and Cho-Oyu with hundreds of the other beautiful mountains. We see Renjola trail to our right and lakes, Gokyo valley, and the biggest glacier of the Everest region to the bottom. after some beautiful pictures from the top, we hike back down to the lodge and have our breakfast. After our packing here than we trek back to Dole. Overnight at the lodge. Day 11 : Trek from Dole to Namche bazaar(3440m. )5 hrs. Crossing non-foresty area, we trek back to the forest again with our familiar trail and climb to Mong danda. Descending from Mong Danda, we arrive on the beautiful trail back again and trek to Namche Bazaar with the beautiful view. Overnight at the lodge. Day 12 : Trek from Namche bazar to Lukla (2840m. )6-7 hrs. Descending from Namche through the pine forest, we again cross the high bridge and other bridges back to Phakding where we stop for our lunch and trek another 3 hours to Lukla. We celebrate our last mountain stay here and be ready for the adventure fly back to Kathmandu the next morning. Overnight at the lodge. The next day, early in the morning, you will head towards Kathmandu through the flight. 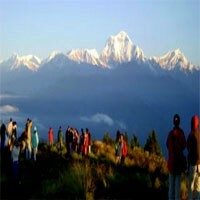 Around 35 minute’s flights provide you with a panoramic view of the Himalayan range and Mt. Everest for the last time. After you reached the Kathmandu airport, you will be taken back to the hotel for the rest and recall all the memories which you were captured in your cameras. Overnight you will stay in the same hotel. Day 14 : Rest day at Kathmandu and enjoy the farewell dinner. Today is your rest day, after morning breakfast, you can visit half day Kathmandu Sightseeing or do some shopping in the Thamel Bazaar. In the evening, you can celebrate the completion of your Jungle Safari tour and enjoy farewell dinner. Overnight at Kathmandu. Day 15 : Final Departure. It is the final day of your trip in Nepal with us and it is time to say goodbye. A representative will help you to reach you towards your final destination. You will drop the airport before 3 hours of your flight.